Help your trees breathe more easily by aerating them this spring. This spring, you’re probably planning to aerate your lawn to keep it in great condition and ensure that it grows in robustly. Did you know that you should also be aerating your trees? Aerating your trees will ensure that all of the vital spring nutrients reach the roots of your trees and contribute to healthy spring growth. 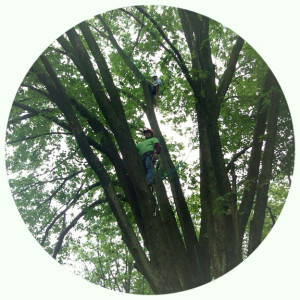 Why is aerating your trees so worthwhile? Even if your trees were expertly planted, they could probably still use a little extra aeration this spring. Over the years and seasons, the nutrient rich soil surrounding your trees will compact and settle. If you have never aerated your trees, the soil around them could be actively harming them instead of helping them. As the space in the soil shrinks, your tree roots will have trouble spreading and growing. Minimal root space can lead to tree stress and eventual death. Aerating your trees will fluff up the soil around the base and add air and space into the area surrounding them. You can use a shovel or spade to manually turn the soil around each of your trees, but that procedure runs the risk of destroying roots. Instead, opt for a professional aerating from Nelson Tree Specialist. We will use professional quality aeration tools to add air into the soil around your trees. These tools actually shoot air into the soil to break up clumps, remove compacted areas, and add in some space for roots to grow. Sometimes, the aerating process even reveals potential weaknesses in the roots so that problems can be addressed before they affect the entire tree. Tree Aeration from Nelson Tree Specialist! This entry was posted on Friday, March 3rd, 2017 at 12:58 pm. Both comments and pings are currently closed.